Trouble Getting Approved in Ohio? Summary of Ohio Usury Law(s) / Quote: "Legal: 5% Contract: 8% but rate not limited for business loans / Judgment: 7% / Corporate: No specific rate"
The snippets of interest are from the Ohio legal codes and rules document. Read full document here on the Ohios State website. Snippet 1.) § (A): Quote: "The parties to a bond, bill, promissory note, or other instrument of writing for the forbearance or payment of money at any future time, may stipulate therein for the payment of interest upon the amount thereof at any rate not exceeding eight per cent per annum payable annually, except as authorized in division (B) of this section." Snippet 2.) § (B)(6)(ii) Quote: "Any loan which otherwise qualifies as a business loan within the meaning of division (B)(6) of this section shall not be deemed disqualified because of the inclusion, with other security consisting of business assets of any such obligor, of real estate occupied by an individual obligor solely as his residence." Andrew needs a $9000 debt consolidation loan in OH. He has had a tough time over the past year but believes he is getting his life and finances back together. He just needs to consolidate is debt so that he is making one payment based on a low interest loan. He has a number of debt problems. He owes a payday loan of $1500 which is based on a really high interest rate and high fees. Next he needed to fix his car which cost him another $3000 for new tires, and other general repairs. There was a storm last month which toppled trees in his area and tore off part of his roof. He has insurance, however they did not cover everything that needed to be repaired. He needs another $3000 to deal with the remaining damages. There is another $1500 he owes on one of his credit cards which is past due and generating an interest expense at 21%. All of this is too much for him. If he can consolidate these debts and get his interest charges lower, he will be able to lower his payments and pay off this debt. Andrew has a steady job and his wife also works. Together they make enough to cover all of their expenses. He plans to finish the repairs himself and just needs the remaining money for materials he will need to purchase. The past year has been a nightmare for him and he just wants it to end. Andrew certainly has had his share of problems in the past few months and these unforeseen expenses can sometimes really cause consumers to make bad financial decisions. Going to a payday loan lender was one of them. They charge a great deal for these loans between the interest charges and the fees to process the loan. Andrew just had too many expenses that came all at the same time, including the damage to his home caused by the storm. Fortunately for Andrew and his wife we found a lender willing to loan him the $9000 he was looking for at a reasonable interest rate. He was able to repay his credit card, the payday loan lender and pay for the remaining damages to his home that needed to be repaired. He found that he did not need quite as much money as he thought. With the extra money he made an extra payment on the loan which will shorten his term and reduce his overall interest costs. Andrew and his wife should have no problem applying for a debt consolidation loan in the future if they need one. His credit is good and if he is able to pay off this loan on time or even early, his credit rating will improve. Hopefully this is the last of Andrews financial problems for awhile. If you live in the State of Ohio and you're struggling with a bad credit rating we hope our website helps you in some way. Last 5 debt service loans approved in the State of Ohio. Source: WFL Lender Pool. Updated Weekly. Principals rounded to the nearest $1000. Relative interest rates listed below in order left to right. Regardless of the why you need to consolidate your debt, there is one tip that is most important. Once you've been approved for your loan there is something important to keep in mind. When you have the money transferred into your account there is something to beware of. It's common for consumers to feel like their debt nightmare is behind them, and before you know it they start spending on their credit cards again. They start spending money freely. They start the cycle of debt all over again, but the next time their credit score will be worse. They're odds of getting approved for another consolidation loan is slim to none. So once you've paid off all of your creditors with your loan you need to stick to a serious budget and get control of your spending. If you can find a way to make some extra money without causing yourself too much stress, that's a great idea too. Georgina from Youngstown had a problem, and that problem was debt. She made the mistake of starting a home renovation project without thoroughly planning it out. She forgot to take in to account the possibility of disaster striking. She forgot about the possibility surprise costs during the reno. Sure enough, when the contractors pulled out the walls of her 1907 home in Youngstown, there was water damage and infestation damage far worse than even the workers could have imagined. By the time it was all over and done, she had spent $30K more than what she had in her budget. And not long after that her HVAC system packed it in. The total replacement on that was another $9000. At that point she was under water for $39000. Then something happened. She didn't think there was any way she was going to be able to pay back what she owed. More than half of the money was on her credit cards and the rest was on her line of credit. She metaphorically threw her hands in the air and said, "what the hell....I've come this far". She went ahead and charged another $11000 on some fancy really fancy Bosch kitchen appliances for her new basement suite. Now she was at $50K and some of the interest rates on her cards were over 20%. By the end of that year she had started defaulting on her payments. The penalty fees and her interest rates started hitting her hard, which literally compounded her money problems. Her credit score was now down in the 570 range and her efforts to get approved for a lower rate on a consolidation loan were all foiled. She tried applying with a few banks and a credit union and was declined. She started hunting online to try and get an approval. She tried applying online for a $50000 loan but she wasn't successful in her first few tries. She was declined again for her low credit score. Eventually she had to get a cosigner for to get approved. Even though she had a cosigner, her interest rate was till more than someone with a better credit score would get. Note that with a higher rate at almost 13% she's lined up to pay more than half the principal by the time the seven year term is over. She didn't really have a choice though because her original rate averaged much higher than 13%. Some of credit cards were over 20% which is pretty much impossible to deal with unless you come into a windfall of cash somehow. With Georgina's job she can manage to service the debt, but if anything happens to her job she'll be in trouble. It's so important not use credit cards in excess like she did in this example. 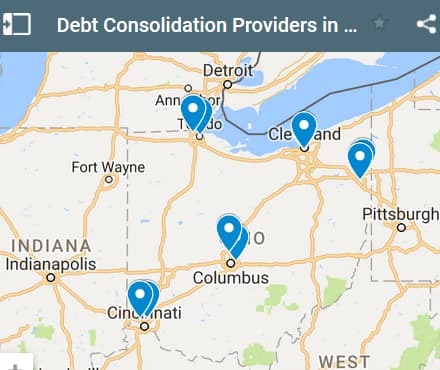 If you live in the State of Ohio and you're trying to get approved for a debt consolidation loan, we hope our website helps you find a good lender and a low interest rate.